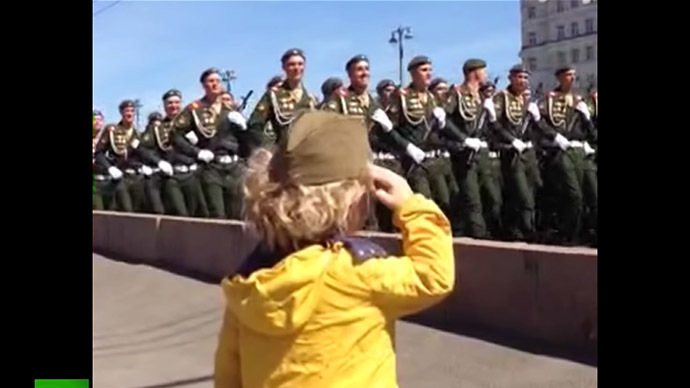 This little Russian had a moment of real pride as troops he saluted on V-Day actually saluted him back, greeting him like a true general. The video of the scene, recorded by boy’s aunt, went viral, melting the hearts of thousands on the Internet. It was May 7 when squadrons of troops were marching in very heart of Moscow in the last rehearsal before the grandiose V-Day parade on Red Square. Amid the crowds on the sidewalks there was Ilya Kazansky – a four-and -a half year old boy, who came to see the soldiers. That moment he might have been imagining himself as a general – the boy started diligently saluting the troops…and they saluted back! Proud Ilya stood still until the last soldier passed by. The boy’s aunt, Elena Tsukanova, recorded the touching scene and shared it on Facebook, where it soon went viral. “They salute our favorite little general. People even filmed this scene,” the boy’s aunt posted. “I like that every one that saw him, just had a huge smile on their faces!” wrote Facebook user Derek Roman. “Mega like! I’m still smiling!” wrote another user, VljevMarko ReezboSlav . On May 9 Russia marked 70 years since victory over Nazi Germany in WWII with a grand parade that involved at least 16,000 troops from the Russian Armed Forces and abroad as well as the newest hardware at the state army’s disposal.